Two weeks out from arrival date full payment is taken. Final numbers will have to be known on this date. There is no refund on a no show or a reduction in numbers from this date. Minimum two night stay at weekends, ie Fri/Sat or fri/sat/sun on bank holiday weekends. 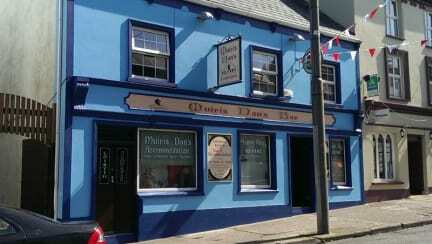 Muiris Dans Pub and accommodation is the ideal location situated in the heart of Dingle. Why not come in and enjoy a pint with Dingle's most decorated Kerry footballer, five-time All-Ireland medal winner Tommy Griffin or take a stroll around town and enjoy the craic in the many restaurants, pubs and shops. Kitchen facilities are now available downstairs with electric cooker/grill, toaster, kettle, microwave, fridge/freezer to cater for all your needs. 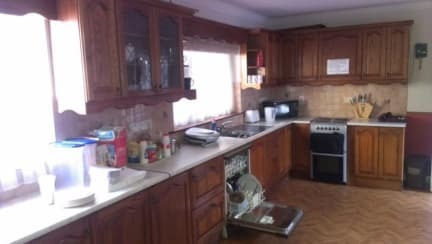 Full compliment of kitchen utensils included ie: pots, pans, cutlery and plates etc. We are an ideal location for cyclists and have a secure facility for bicycles. We also have a foot pump available to our guests to pump tires. Bicycle hire is available in a nearby shop. WiFi available throughout our premises: in rooms, bar and kitchen. We are 3 minutes walk from the bus stop. Check In Time: 12 noon (bags can be dropped in earlier if required). Please call to shop next door for more information if bar is closed. We loved this place! Very clean and great room. Padraig and Tommy make you feel welcome. Great pub and location. Excellent. I like this place very much. The rooms are small, and it is very crowded, but during our stay, the room was not full, so it seems to be okay. The owner was v nice and welcoming, staff were v helpful and friendly. The springs could be felt through the mattress, but I was so tired it didn't stop me from sleeping! There was free breakfast in the morning! Free Parking outside and you couldn't get a better location, it was right in the centre of everything. I would definitely recommend it and Dingle to anyone wanting to stay a couple of nights, price was v good also! Thank you! Great location and Patrick was super friendly and helpful. And the gentleman from the shop next door that helped us with getting in was an absolute delight. Only down fall was no caged security cages in room and no hot water for showering in the morning. Hostel was in a great location and check in and out was super easy. Bathrooms were a bit dirty and showers were frigid and had zero water pressure which was brutal. Beds were comfy just the room was a bit small if the other two guests would have been there(stayed in 4 person dorm). The owner and staff were friendly and helpful, the kitchen was spacious and well stocked. The drawbacks were: poor lighting in the rooms, burned out lights in one bathroom, hot-cold water in one shower so you were scalded and froze in turn; faulty or broken outlets in rooms; a portable heater that didn’t work; and having to go outside and through the back to get to the kitchen when the pub wasn’t open (all day) with no access if nobody came to open the gate. Fair, wouldn’t take much to be great. Very basic hostel. No front desk or staff to help. No lockers in the rooms or anywhere. Just a very very basic accommodation. If that's what you're looking for, then it's fine. I felt it was a little too pricey given that though.